As these bronze looking Manganese brass dollar coinsÂ enter circulation, they soon startÂ lookingÂ greenish and of course, ugly.Â Â So the question is…Â why would anyoneÂ want them inÂ one or moreÂ pockets? In the basement of a Baltimore vault the size of a soccer field, 1 billion dollar coins are just sitting there at a cost of .30 each. Thanks, Congress. NPRâ€™s Planet Money reporters recently investigated the $1 presidential coin program, which was a Congressional effort to get more $1 coins into circulation while also trying to be educational. The problem is that nobody really wants them. Well, not nobody. Sixty percent of the coins make it into circulation. But that other 40 percent? Theyâ€™re sitting in vaults. In fact, the Fedâ€™s even running out of space for them. Each coin costs the government 30 cents to make, so the piles in those vaults have cost the government $300 million so far, according to NPR. The whole thing started in 2005, when the Presidential $1 Coin Act was written into law. While the legislation seemed to have good intentions, when the U.S. Mint started producing the coins a couple years later, the demand just wasnâ€™t there. I mean, had you even heard of the presidential $1 coins, let alone seen one? 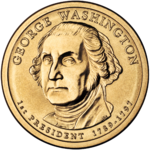 At the same time, the legislation mandated that a certain number of Sacagawea coins be made in conjunction with the presidential coins, which has now amounted to one Sacagawea for every four presidents. And I think we know how well those coins went over. Considering our national debt, couldnâ€™t we just use all that money to help pay some of that off? Well, not exactly. The coins in the vault arenâ€™t exactly money yet. They havenâ€™t been funneled into the financial system, so in the meantime, they have no real-world value until a bank or a collector actually buys them. At the moment, the program is still moving forward, and NPR projects that by the time itâ€™s finished, 2 billion coins could be sitting in the Fedâ€™s vaults. Next up for minting is our 19th president, Rutherford B. Hayes.